A big link building budget is very exciting and opens the doors for exciting content creation, influencer collaboration and opportunities for different types of amplification. But in reality a big budget for link building or content marketing campaigns is rarely the starting point for many businesses or new clients you may take on as an agency. In fact in the beginning, link building can often appear to be a waste of resource with no immediate return on investment to show, or conversely viewed as something that can be done quickly and cheaply. As practice shows, neither of these are the case. Link building done well can and does move the needle but comes with a price tag. But for the sake of getting future buy in, building trust or showing expertise it’s sometimes necessary to build quality links for a client or employer on a shoestring budget. Unlinked mentions are simply mentions of your brand (or related mention e.g. CEO name) that do not have a link back to your website. One of the least glamorous forms of links building, but when done in a timely manner can convert at an insane rate. In fact for us, unlinked mention link building can often outpace other link building methods that are running simultaneously. Also a particularly effective way of quickly building links for a new client. There are many different ways to find unlinked mentions, from performing a simple Google search to investing in software that constantly trawls for new mentions for you. A simple, fairly effective and free way to get started with unlinked mentions is probably Google Alerts. Simply enter a few terms that you want to monitor and you’ll get an email if they make an appearance online. To begin with you’ll want to play around with what terms you monitor as if you go too broad you’ll probably end up with a lot of unrelated mentions coming through. Once you start getting relevant brand mentions coming your way it’s a simple case of finding a relevant contact and politely asking for a link. I find personalised, timely, short and sweet messages converting the best. Creating a linkable asset can be expensive, but many obvious and some not so obvious sources of free data exist that you can use to dig out some truly remarkable facts that can easily be turned into a great asset. Let’s start with a source you will definitely heard of but might not considered digging in to for some interesting data – Wikipedia. 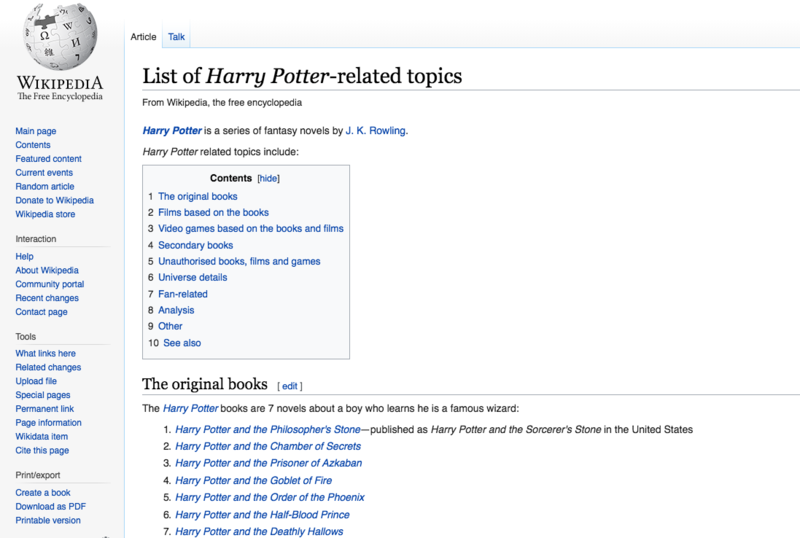 Let’s suppose you’ve decided to do some Harry Potter related content marketing and you decided to build an interactive guide to the Harry Potter ‘Universe’. Where could you quickly grab a list of all of the books, films, video games, unauthorised books and fan related creations? Wikipedia of course. 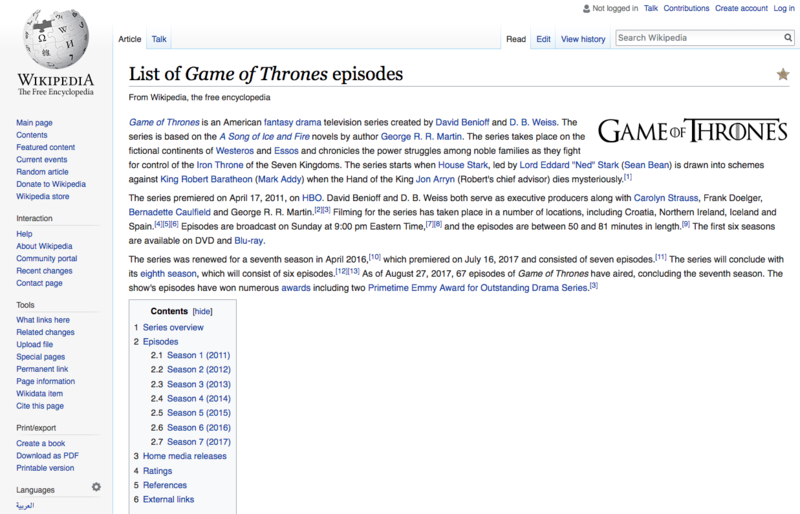 Want to create a graph detailing the viewing figures of Game of Thrones episode by episode since it began? Wikipedia of course. Aligning this type of data with your own data or message can produce something truly unique and interesting. The third and final free data source we’ll discuss is the Kauffman Index. This index is a well known indicator of the new business creation in the US. At first glance it might seem a bit limited but a lot of things happening in the world can be compared with how well business or particular aspects of business such as entrepreneur or startup growth is doing. How did Donald Trump becoming president affect start up growth in states he won vs lost? If you dig in to enough questions like this you will eventually find some revealing data that would be of a wide interest to your audience. There are a lot of other free reliable data sources out there so don’t just rely on these few. Once you have the idea and data now it’s time to create the asset. Asset creation can be extremely costly and time consuming, so when you know you are on a budget it’s important to bear simplicity in mind, and simplicity doesn’t mean poor quality. If you will be creating multiple assets then establishing style guidelines that everyone agrees on and likes early on will pay dividends in the long run. If you are able to establish a set of guidelines then one slightly more affordable route you can take is to hire a designer to create a range of templates so that even those members of your team that have no designing skills can create good looking, on branded assets in the future. That is often the approach we take but when budget doesn’t allow for a designer at all we use other great WYSIWYG (What You See Is What You Get) tools that allow even the least design minded person to create a pretty good looking asset. Our personal go-to is visme. As well as having a range of great templates for everything from social media graphics to infographics, visme allows you to create HTML version of graphics that you create. The reason we love that tool so much is that you can create a great looking, interactive content for a client’s site without needing design or coding skills. You can literally create content that would cost thousands for a tiny fraction of the price. PRO TIP: combine the above to points and hire a designer to create templates in your WYSIWYG tool, ensuring you not only have full control but that you can continue to push out great looking assets consistently without having to pay for design work again. Prospect, Outreach and Get Those Links! The first step is deciding where you would ideally like to get links from. You probably already have a few names of people you want to reach but a quick way of building up a prospecting list is to find a similar asset that did well and see who linked to them. PRO TIP: Use the Backlink Checker to quickly find potential prospects. Find a similar asset that has done well, check their backlinks and add the ones you like to your list. For many people outreach is an art, but the truth is so long as you have something new and interesting on offer and you are speaking to the right prospects then it should be pretty easy to secure some links. Whenever I’m receiving a feedback on why some prospects decided not to run what has been offered it’s always because the content was of a poor quality, had been already published someplace before or was untimely or irrelevant. No one ever complained that my email had a spelling mistake in it. That being said make sure your emails are as professional as possible to stack the odds in your favor. Personalise when appropriate – this isn’t inserting ‘I saw your recent article about X’ this is more following up on any previous contact you’ve had with them, or tailoring the message so it’s a more appealing for their outlet. Follow-up – follow-up is a dirty word but people are busy. Give them a fair amount of time to respond and send a friendly reminder if you don’t hear back. If you are running multiple campaigns consider investing in some processes and tools to help you keep track of communications. We’re a big fan of boomerang that helps to stay on top of all relationships and Mailshake when you need a bit more scale or be a bit more tactical about your outreach. You’ve gone to all of this hard work, created a great looking unique asset and your target site has published it, great! This is the perfect scenario with one exception – they published your asset without attribution, no link. I know this feeling all too well and it can be truly heartbreaking after all of the effort and thinking you did to get the link, but don’t worry – all is not lost. There is a sliding scale of why people don’t link back to you in this situation, ranging from it was a mistake right up to because they simply don’t care. Whatever the reason the first step is to always ask for the link as quickly as possible. Be polite and firm, you went to a lot of effort and gave them a great asset and actually helped them out, so at this point about 75% will probably add the link. The remaining 25% will suddenly go quiet, simply tell you no or try and explain that they don’t understand. For the sake of future relationships you have to take this 25% on the chin and do two things to stop it happening again. Develop a personal database of who generally does link and generally who doesn’t, the non-linkers are still useful for clients who just want the exposure or mention. But you can make sure to avoid them for clients who just want the links. Secondly, improve on your why link reason. Giving people more reasons to link back to you will increase the amount of links you get over time, whether that is publishing a much more in-depth version of something on your own site so that it makes perfect sense to link back. You might want to give prospects the fully story, but not the full data behind the story. However, in every case you should be thinking about the why link reason and try to come up with a novel solution that will increase the chances of getting that link. Marcus is the founder of Searchant — a digital marketing agency that helps businesses increase their organic visibility with transparent SEO methods.